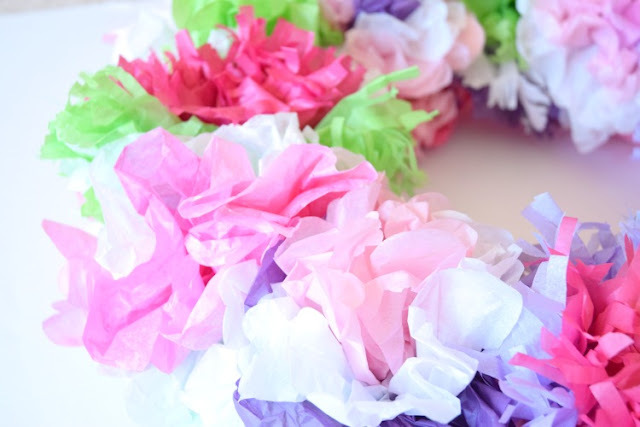 This Tissue Paper Flower Wreath makes such a bright and cheerful decoration for spring or summer! It would also be a great way to welcome guests to a birthday or end-of-school party! 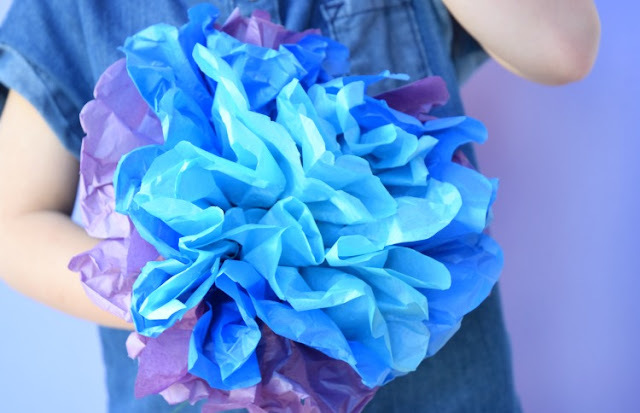 You can easily whip up the tissue paper flowers that you need in any color combination that you'd like, and have this done in no time. 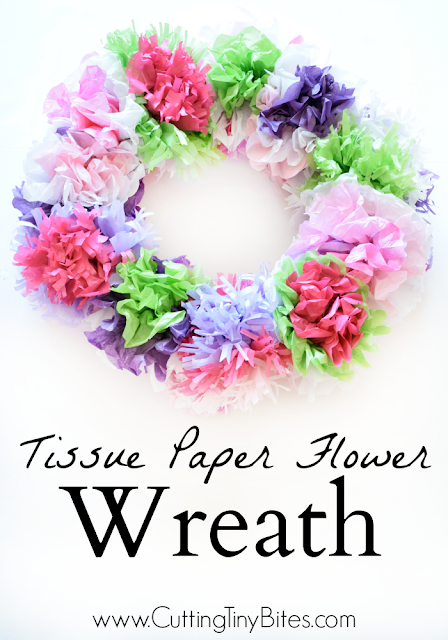 Here's how to make your own Tissue Paper Flower Wreath. 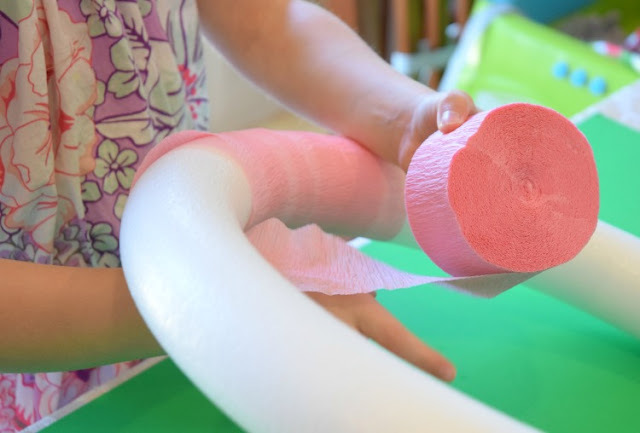 Start by making lots of tissue paper flowers. Learn how to make them in this post. For our 16" wreath, we ended up using 12 flowers of the size described in the post (approximately 10" in diameter). Choose several coordinating colors, with a variety of shades. For our wreath, we used pinks, purples, green and white. Next, pull our your wreath form. We used this basic styrofoam one, but most any kind would work. You could even cut a large circle from some scrap cardboard! 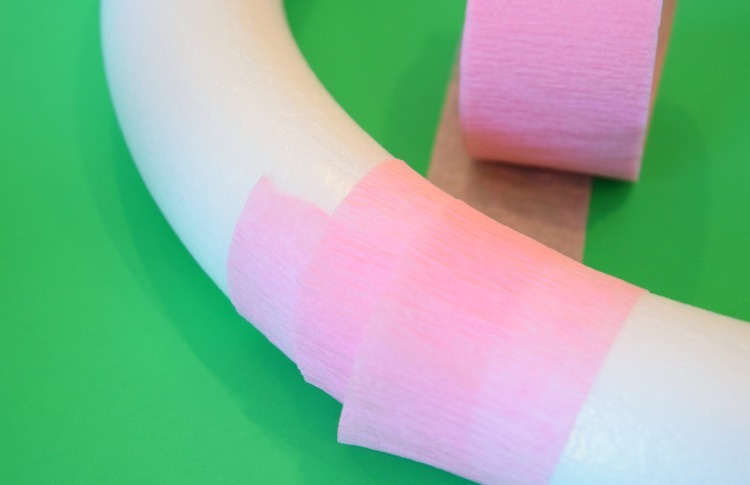 Take a roll of crepe paper and tape down one end. Wrap the crepe paper around the wreath. This will camouflage any gaps in your wreath that you may have. A coordinating color of crepe paper won't show through nearly as much as the stark white of the wreath if you miss any spots. This is a great job for kids! Around and around until the whole thing is covered. Tear or cut the paper and tape the end to secure it. Now it's time to add the flowers. Simply take the pipe cleaner or floral wire "stems" from your flowers, wrap around the wreath, and twist to secure. Make them tight so that the flower doesn't move back and forth on the wreath. 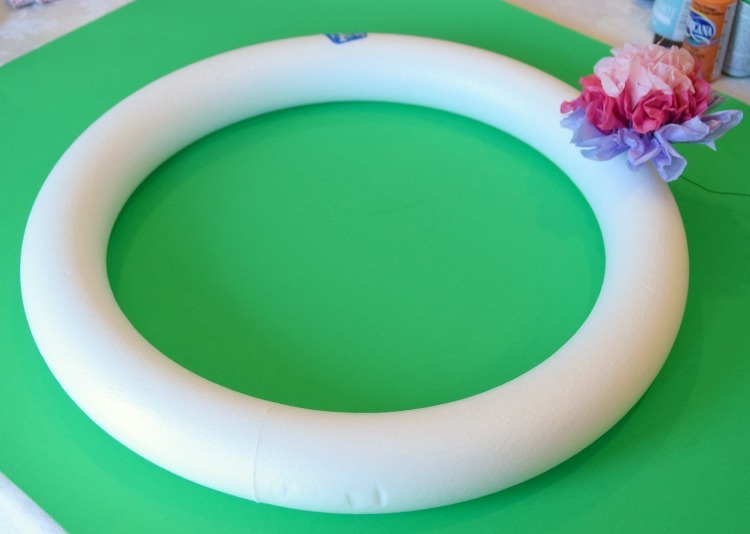 To hang the wreath, use floral wire to make a hook or you could use ribbon to make a loop. The tissue paper flowers are beautiful on their own, but they become extra beautiful when they're packed in tight like this! 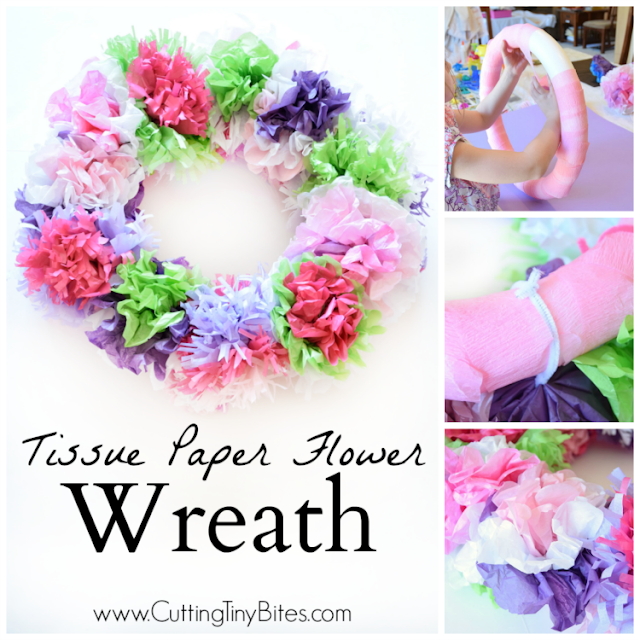 This tissue paper flower wreath would be a fun project for spring or summer. 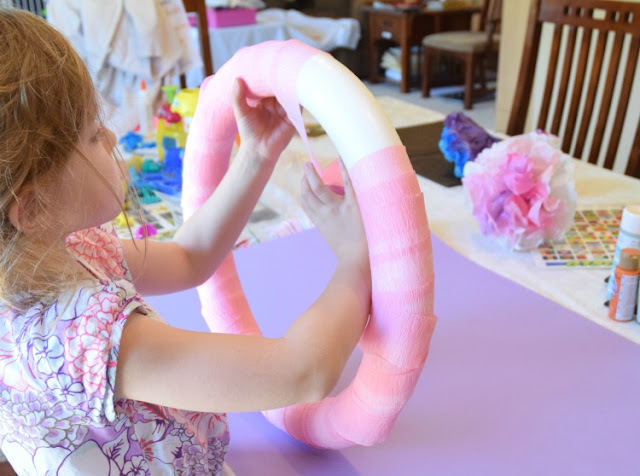 You could also have each of the children at a birthday party make a flower and then combine them in to a wreath to make a nice keepsake for the birthday child! Tissue Paper Flower Wreath. Beautiful decoration for spring or summer. Kids can help make flowers and then attach them to the wreath with this easy and beautiful craft.